Lately the welknown website of the tourist review - tripadvisor. Suggested the best 25 tourist destination in Thailand of 2018. Believe it or not, the 2nd destination is Phuket, Thailand. I keep asking myself the proper reasons why. Finally, I got it. After the huge wave of tourists immigrated from every corner of the world a decade ago. At this moment, I don't think is there anyone who don't know Phuket or even Thailand. Not just only time that create the popularity to the city. But also what its has - the location, the beauty and most of all - the people. The people here comes from every where in the world. Not just only Thais but also expats too. So, we could say this is the little world where you can meet all the nation walking in the streets. More people, more business and unlimited opportunities. For the locals, this is likely to be another gold mine which is the luck is independable. There was 35 million visitors to Phuket last year - 2017. There are a few surprises in the top ten list, including Laotian visitors at #4. China is still the number one source of foreign tourists with 9.92 million visits over the past 12 months. This represents a 13.23% increase on the 2016 statistics. 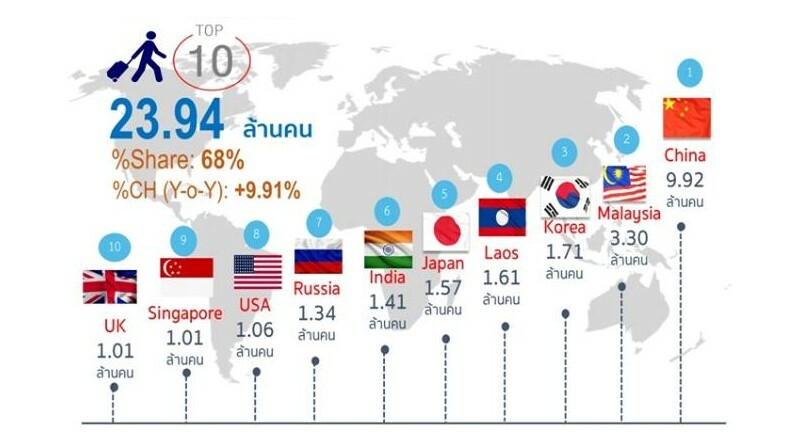 Coming in second, but actually dropping 5.5% in real numbers, is Thailand’s southern neighbours from Malaysia. The Russians are coming back in increasing numbers logging nearly 23% growth in arrivals for the last year. As the statistic shown above. Well, the hidden opportunities among these tourist still a challenge. Before they plan to do something else during their stay. They searched for a place for their night stay first. This year only the peak season (2017 - 2018), the accommodation in Phuket was occupied by 95%. Saying it's mostly full for the walk-in. So the future for any kind of hotels is still bright at least for a decade. One of the eye catching project in the best location of Phuket is The Peaks Residence. This is the new and future style with a unique view of Kata Noi beach, the top beach voted by tourists over the world - 2017. Just only 15 minutes from the welknown beach of Patong or 10 minutes to downtown. 1 hour from the Air Port. All kind of transportation provided here. What would you call if not a holiday heaven?